I could make a joke about the cat needing braces, but it would make it mad and then I'd get bit and I don't want that to happen. So, no tooth jokes. Why no tooth jokes? Have you looked at those tooths? Do you realize the damage they could do to you? Don't you think I know it's an extinct creature that poses no threat to me? Don't you think I'm happy that it can't hurt me? Am I asking too many questions? Should I stop? No? You sure? The picture up there is, of course, a Smilodon. AKA, a Saber Toothed Tiger. Even though it wasn't a tiger, it was just a big cat. Why is it called a Saber Toothed Tiger if it wasn't a tiger? Because people are stupid. They see a big cat and think 'tiger!' or 'lion!'. 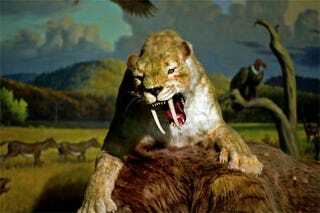 In fact, there were about a dozen saber toothed cats that roamed America in the Miocene and Pleistocene eras, and not a single one of the were tigers. So, stop calling them Saber Toothed Tigers! They are Smilodons! All these would have been bad enough. Some strong while others were weak. Some full of fight, others only wanted everyone to get along. But you didn't click on this post to hear about saber toothed gophers! NO! You want something odd! Something well and truly odd! Oncorhynchus Rastrosus. Never heard of it? I'd be surprised if you had. This was a big....Fish. A salmon, to be exact. A Saber Toothed Salmon. And, not only was this salmon equipped with saber teeth, it was also bigger than you. An adult was between 6 and 9 feet long. But, other than their giant size and their huge fangs, they were otherwise just like a normal salmon. Quite tasty when poached with butter, lemon and parsley. In fact, if you want to eat one, (or a pretty close representation to one), grab a Sockeye Salmon. That's it's closest living relative.